KBB.com 10 Best UberX Candidates. This Toyota Corolla boasts a Regular Unleaded I-4 1.8 L/110 engine powering this Variable transmission. Wheels: 17 x 7.0 Alloy, Urethane Gear Shift Knob, Trunk Rear Cargo Access. *This Toyota Corolla Comes Equipped with These Options *Trip computer, Transmission: Continuously Variable (CVTi-S), Torsion Beam Rear Suspension w/Coil Springs, Tires: P215/45R17 All-Season, Strut Front Suspension w/Coil Springs, Steel Spare Wheel, Sport Fabric Seat Trim -inc: sport bolsters and sport inserts, Single Stainless Steel Exhaust w/Chrome Tailpipe Finisher, Side Impact Beams, Seats w/Cloth Back Material. * The Votes are Counted *KBB.com 10 Most Affordable Cars, KBB.com 10 Best UberX Candidates, KBB.com 5-Year Cost to Own Awards, KBB.com 10 Tech-Savviest Cars Under $20,000. 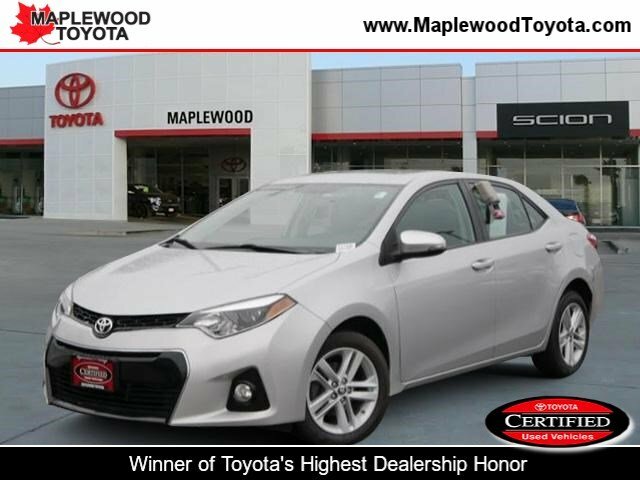 * The Experts' Verdict...*As reported by The Manufacturer Summary: The Toyota Corolla is a fresh take on the design of a long-time icon. It has been given major stylistic changes inside and out resulting in a car that is edgy, fun, and economical all at once. The new front grille and dramatic headlights show off its attitude, complemented smooth aerodynamic lines all the way back to the stylish new taillights in the rear. With 4 models there is a Corolla for almost every taste. Toyota has given shoppers 2 peppy 1.8L, 4-Cylinder engine alternatives. The version for the L, LE, and S models has Dual Variable Valve Timing with intelligence and 132hp. The engine in the LE Eco has Valvematic technology and 140hp. 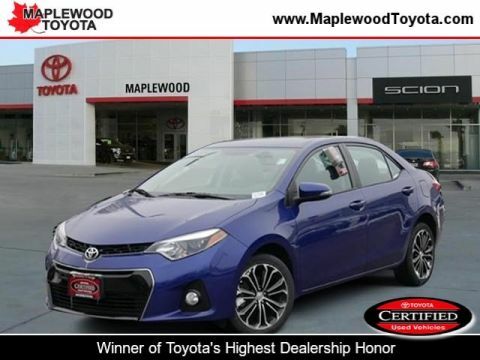 Depending on the model and trim you select you can get a 6-Speed manual, a 4-speed automatic Transmission with intelligence, or a Continuously Variable Transmission with intelligence and Shift Mode. Fuel efficiencies vary by trim, but the best is the LE Eco CVT with an EPA estimated 30 MPG city and 42 MPG hwy. Passengers up front will be comfortable in adjustable, Whiplash-Injury-Lessening seats. Plus, you will be soothed with Air Conditioning or Automatic climate control, depending on trim level. The base L trim comes nicely equipped with essentials like power windows, locks and outside mirrors, and a steering wheel with audio and Bluetooth hands-free phone controls. In addition, you get Tech Audio with AM FM CD, Auxiliary Jack, USB port, iPod interface, and hands-free calling and music streaming utilizing Bluetooth. The top-level S trims offer enticing features like Paddle Shifters for precision driving, Sport Drive mode, 17-inch alloy wheels, Push Button Start, a Multi-information display, and the amazing Entune Premium Audio System with Navigation and App Suite. 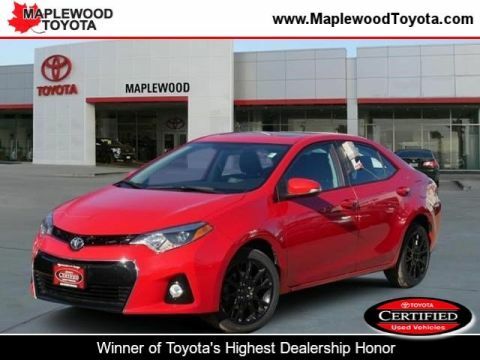 * Stop By Today *Live a little- stop by Maplewood Toyota located at 2873 Maplewood Dr, Saint Paul, MN 55109 to make this car yours today!